> 18K Gold bracelet "PIZZO REGALE"
18K Gold bracelet "PIZZO REGALE"
Filigree bracelet in Gold 18K,made with indian rubber. Modern design, handmade. 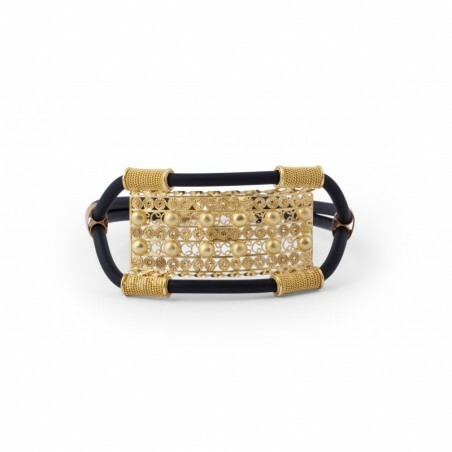 Filigree bracelet in Gold 18K made with indian rubber. Modern design. Filigree bracelet in Gold 18K made with indian rubber. This modern and original jewelry reinterprets traditional Sardinian goldsmith's art in a more contemporary perspective. Handmade in Sardinia (Italy) by artisan Loredana Mandas, goldsmith expert in fine Sardinian filigree jewelry.